Back when our regional DNR Forester paid us a visit, he pointed out how many ash trees we have. I had been mistaking many of them for butternut trees, but closer inspection, and a noticeable lack of nuts, changed my perspective. As a result, now my first impression of our trees with pinnate leaves is that they are likely ash. 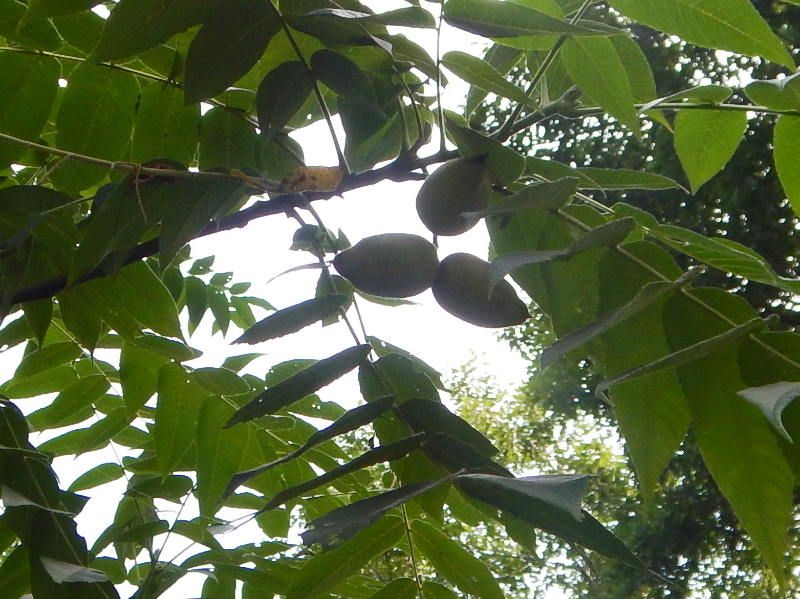 While we were sitting with the chickens on the edge of our driveway the other day, I gazed skyward and became aware of a large umbrella of the pinnate leaves looming over us. Mentioning it out loud to Cyndie, I assessed it as a big ash that we didn’t even know was in that spot. Until I saw the nuts. Oh! So, it’s back to a butternut again. From the class we look last winter, I was quickly able to detect one of the simplest identifying differences: the petioles or leaflets of the compound leaf. The ash tree has about 7 leaflets arranged in opposing orientation along the stem. On this butternut, I counted repeated occasions of 13 leaflets, and they are arranged in alternate orientation along the stem. Combined with the obvious groupings of nuts, there was little question about what kind of tree this was. I’m a bit surprised by the significance of the canopy of leaves on this tree because the butternut canker disease is stunting the progress, or outright killing most of the butternut trees in the area. It is possible this tree has an inherent resistance to the fungus. That would be great luck. Offspring from this tree could lead to additional trees with resistance. Invert the pyramid, I say! Another fungus. What’s up around here?